Gas line repair and replacement is a project that should always be left to the professionals. The job is highly specialized, and without the right tools and training, trying to do it yourself can be extremely dangerous. When you need gas line replacement in Macedon NY, let the professionals at GT Campbell Plumbing help. We offer gas line services throughout Monroe County, and we have built a loyal customer base that comes to us time and time again for all of their gas line needs. The odor of gas is the most common sign of a gas leak in your home or on your property, but there are a couple others signs to pay close attention to as well. If you hear a roaring, hissing or whistling sound near a gas appliance or pipeline inside your home, a gas leak is the likely culprit. Outside your home, common signs of a gas leak include discolored vegetation near gas lines, debris or dirt being thrown into the air and unusual bubbles in streams or ponds on your property. If, for any reason, you think you might have a gas leak, it’s crucial to call a licensed contractor immediately. A leaky gas line is an emergency situation that needs to be addressed immediately to avoid potentially deadly consequences. After you call your trusted plumber for help, vacate the premises until help arrives, and do not turn on any electronic devices or use your cell phone as doing so could cause a spark and ignite the gas. Here at GT Campbell Plumbing, we use the best leak detection equipment to quickly find the source of your leak. The sooner we find the leak, the sooner we can get to work on fixing your problem. 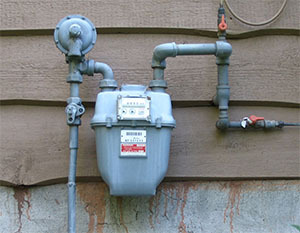 Whether the leak is outside on your property or inside your home, trust us for gas line replacement in Macedon NY. For emergency gas line replacement service, call your trusted plumber in Macedon now!